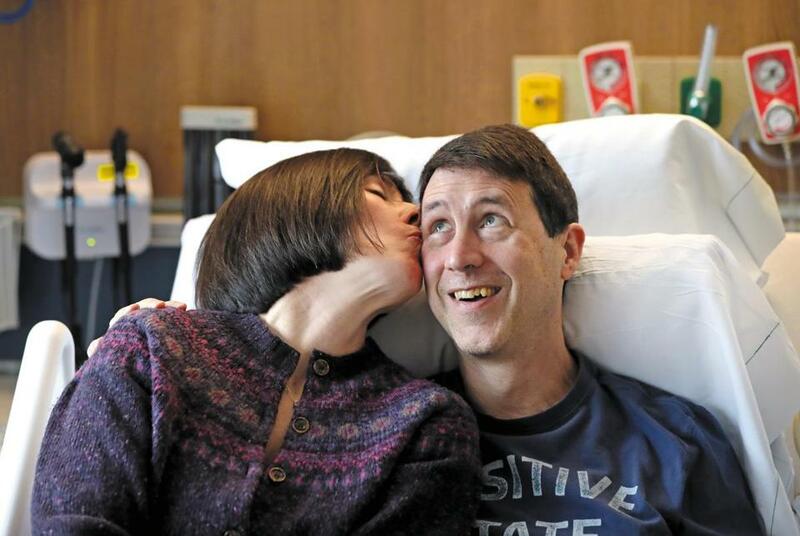 Richard Vinci, with his wife, Michelle Geoffrion-Vinci, at Massachusetts General Hospital, where he is taking part in a late-stage clinical trial of a treatment for amyotrophic lateral sclerosis. He was diagnosed with the disease 18 months ago. But now the 51-year-old graduate of MIT and Stanford University is the subject of a study himself, one he hopes might save, or at least extend, his life. Vinci, a Reading native, was diagnosed 18 months ago with ALS, the deadly disease that ravages the nervous system and gradually robs patients of the ability to speak, eat, and, finally, breathe. He is an early participant in what experts say is the first late-stage clinical trial in the United States to determine if stem cells harvested from bone marrow, modified during the manufacturing process, and then injected into a patient’s spinal canal fluid will halt or slow the dreaded disease. MGH and the University of Massachusetts Medical School in Worcester are among six sites across the country testing the therapy, NurOwn, developed by BrainStorm Cell Therapeutics, which has offices in Israel and New York. Hopes are high — as they often are at the start of a trial — but the challenge is daunting. Amyotrophic lateral sclerosis, commonly called Lou Gehrig’s disease, has long confounded some of the best minds in medicine. Since 1995, only two drugs have been approved to treat it, and neither works very well. Over the past five years, at least 100 clinical trials of potential ALS treatments have failed. Despite the best effort of doctors and researchers, it still kills most patients in three to five years. Some of the most prominent ALS researchers in the United States are working on the phase 3 clinical trial. NurOwn, they say, is the first stem cell therapy for ALS to have gotten this far, and it showed tantalizing results in a small phase 2 trial involving 48 patients — 36 of whom got the cells and 12 of whom received a placebo. Twelve weeks after a single dosing, the treatment had temporarily slowed or halted the progression of the disease or even improved functioning in more than 40 percent of patients who had been rapidly deteriorating, according to BrainStorm executives. “We have seen wonderful results in a smaller patient population,” said Chaim Lebovits, president and chief executive of BrainStorm, although some ALS experts described the outcomes as underwhelming and noted that the firm hasn’t attracted any large pharmaceutical partners. In the new larger trial, 200 patients will be given three doses over two months and then be monitored for several months. Half will get stem cells and half a placebo. The results are expected in late 2019. If the trial is successful, the company plans to seek Food and Drug Administration approval to sell the treatment. Vinci, of Easton, Pa., had stem cells extracted from bone marrow in his hip last month at MGH. He and his wife, Michelle Geoffrion-Vinci, a Spanish professor at Lafayette College, had repeatedly visited the hospital over three months so researchers could gauge how fast the disease was progressing. On March 22, medical staffers gave him an injection in his spinal canal while he was awake. He has no idea whether it contained the stem cells that were taken from him in February and processed at the City of Hope National Medical Center outside Los Angeles. To preserve the integrity of the trial, patients aren’t told whether they are receiving cells or a placebo. The six test sites include the three hospitals in the earlier trial — MGH, UMass, and the Mayo Clinic in Minnesota — as well as California Pacific Medical Center in San Francisco, Cedars-Sinai Medical Center in Los Angeles, and University of California Irvine Medical Center. In the field of ALS research, where many seasoned clinical investigators have participated in dozens of trials with disappointing results, the NurOwn trial seems more promising, according to several researchers involved. Dr. Robert Brown Jr., who runs the neurology department at UMass and who in 1993 led a research team that discovered the first gene linked to the inherited form of ALS, noted that doctors routinely use stem cells from bone marrow or blood to treat cancer and blood disorders. In the case of NurOwn, BrainStorm modifies harvested stem cells to secrete growth factors believed to promote the survival of motor neurons that haven’t been damaged by the disease. Dr. Merit Cudkowicz, who runs the ALS program at MGH, said the small phase 2 trial indicated that the stem cells may have temporarily stabilized some patients and reduced signs of inflammation in the brain that scientists consider important signs of the disease worsening. Not everyone is optimistic that the new trial will yield significant results. Steven Perrin, president and chief scientific officer of ALS Therapy Development Institute, a Cambridge nonprofit biotech research group that’s also searching for treatments, said it was exciting for any ALS therapy to reach a late-stage trial. But BrainStorm’s cell therapy, he said, appears to have only a modest effect on patients. Today, the only drugs prescribed to slow the progression of ALS are Radicava, approved in 2017, and riluzole, the generic name of Rilutek, which was OK’d in 1995. At best, neurologists say, they have a marginal effect. A third drug, Nuedexta, is prescribed to treat unpredictable episodes of crying and laughter that sometimes occurs in ALS. But the medicine doesn’t affect the underlying disease. One reason ALS is so challenging to study, said UMass’s Brown, is because it is relatively rare. In Europe and the United States each year, there are one or two new cases per 100,000 people. That’s traditionally meant limited funding for research, although the “Ice Bucket Challenge” — inspired by former Boston College baseball player Pete Frates, who has ALS — has raised over $115 million since 2014, according to the ALS Association. Most of that has gone to research. ALS tends to affect people in their middle-to-late 50s, although it can appear in teenagers and people in their 90s. The rate of physical decline varies, which makes it difficult to determine whether periods of stability are due to a medicine or the natural course of the disease. About 10 percent of cases appear to be inherited. The other 90 percent occur in people with no family history of ALS. To complicate matters, Brown said, at least 40 genes have been implicated in the disease. Dr. Robert Miller, the 76-year-old neurologist overseeing the trial at California Pacific Medical Center, said ALS is the “grim reaper of neurological disease,” cutting people down in their prime. “It’s kind of a big deal to get to phase 3, but just about every time you get to phase 3, we have seen failure,” said Miller, whose patients included the late Senator Jacob Javits of New York, who died in 1986. Several researchers said they hope the trial dispels unproven claims by unscrupulous clinics that market stem cells as a panacea for ALS.